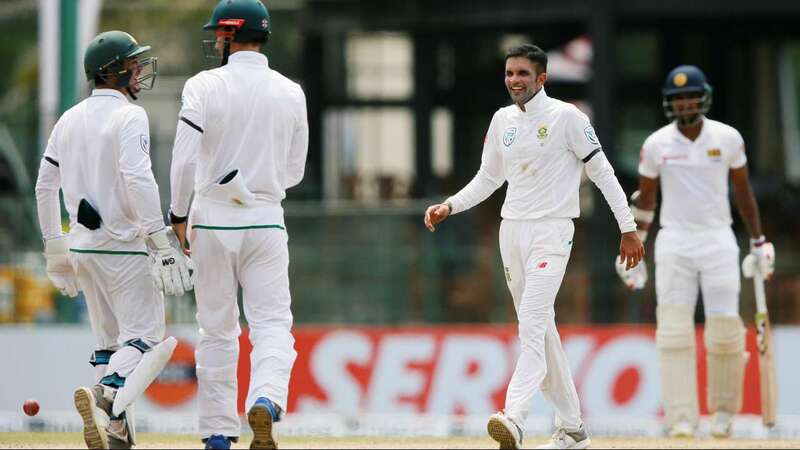 DNA – Left-arm spinner Keshav Maharaj claimed career-best figures of eight for 116 as South Africa restricted Sri Lanka to 277 for nine by stumps on the opening day of the second Test match at the Sinhalese Sports Club grounds in Colombo on Friday. Left-arm spinner Keshav Maharaj claimed career-best figures of eight for 116 as South Africa restricted Sri Lanka to 277 for nine by stumps on the opening day of the second Test match at the Sinhalese Sports Club grounds in Colombo on Friday. After a promising start where the openers put on 116 runs for the first wicket, Sri Lanka collapsed as Maharaj bowled a probing line. Since then Sri Lanka have gone through 21 Test matches without a 100 plus partnership by the openers. In the final sessions play, Maharaj claimed five wickets to put South Africa on top. Last man Rangana Herath along with Akila Dananjaya survived 19 nervous minutes as South Africa tried to bowl Sri Lanka out on the opening day.